Szolnoki Olajbanyasz (A Division) strengthened their roster with addition of 26-year old American (has also Bissau-Guinean passport) point guard Perry Petty (185-86kg-88, college: UTPA). He already started the season at Virtus Acea in Italian Serie A. The most of last season Petty spent at VL Pesaro (Serie A) in Italy. In 14 games he recorded 11.4ppg, 3.8rpg, 3.1apg and 1.2spg. He also played at Tsmoki-Minsk in Belarusian league earlier that season. 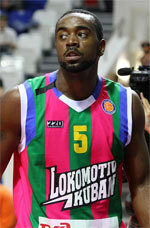 In 7 EuroChallenge games he averaged 11.7ppg, 6.4rpg, 3.1apg and 1.9spg. Petty also played 10 games in VTB United League where he averaged 8.2ppg, 3.0rpg, 3.5apg and 1.4spg. The previous (2013) summer he played at Trotamundos (LPB) in Venezuelan league. In 5 games he averaged 5.2ppg, 1.8rpg, 3.0apg and 2.4spg in 2013 season. The last (2013) season Petty played at CSS Giurgiu (Division A) in Romanian league. In 38 games he was the best scorer with impressive 20.8ppg and had 6.4rpg, 4.9apg and 2.1spg (in top 2) in 2012-13 season. Great year indeed as he was voted to Eurobasket.com Romanian League All-Imports Team, 2nd Team and to the All-Star Game. The scouts decsribe him following way: Perry is a Point Guard that can control the tempo of a game and creates problems with his shooting ability on the offensive end of the floor. He is a very aggressive defender and is able to guard positions from the 1 or 2. Great rebounder for his position and is able to be very effective in the pick and roll set.